The Evolution Series 4 Integrated Chains are for convenient bicycle protection in moderate to high crime areas. The hardened triple heat-treated boron manganese steel chains include 10mm six-sided links. The integrated chains secure with a new patent-pending integrated Evolution series 4 lock head. This innovative series of chains also feature a patent-pending pin-less design which secures the chain to a hardened deadbolt and allows for no weak leak in the chain due to extensive holding power of the link itself against attacks. Chains are enclosed in a nylon-webbing sleeve to protect paint from scratches and allow for easy portability and tight coiling during storage. Comes with 3 stainless steel keys including an lighted LED key with replaceable battery and 2 new, ergonomic 'I' keys. 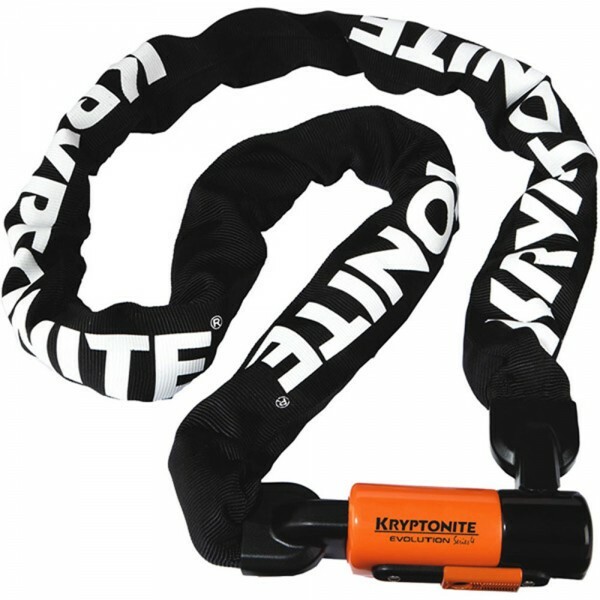 One key is lighted for easy access at night; replaceable battery insures that light can be used as long as the lock. The new 'I' keys make opening a disc-style cylinder much smoother. Approved to Gold Sold Secure standard. Approved to Thatcham CAT3.